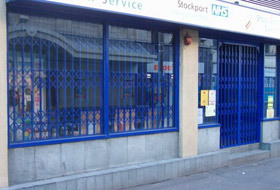 Do you have a property in the Oldham area and are looking for a robust instalation of retractable security grilles? 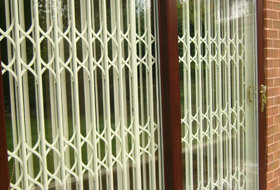 All our security grilles offer strength and security for all sizes of windows and doors. They create minimal obstruction to visibility and natural light, even when closed and can be colour co-ordinated to combine security with an acceptable appearance. You can view the range of colours here. 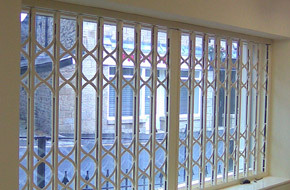 Our grilles can be manual or automatic and be fitted internally or externally. 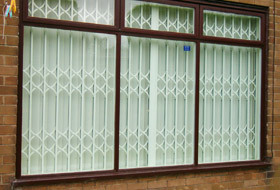 Visually they provide a great deterrent and are designed to keep intruders out but let the maximum amount of light in. They are ideal for vulnerable ground floor doors or windows such as patio doors and French windows and they can be fitted relatively quickly. 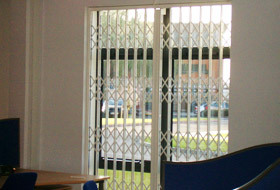 When not in use our retractable security grilles are surprisingly unobtrusive. They hang from a top track with a guide track at the base which can be supplied as an optional extra to quickly fold away when not required. Whether a home or business premises, as local secuirty installers our installation teams can quickly, economically and professionally provide security to your property in the Oldham area. In a home installation the grilles can be folded neatly behind curtains and the top track can be hidden behind a pelmet blending your lifestyle with knowledge that your home and family are protected. Our grilles are exceptionally safe and easy to handle with a smooth, quiet operation and available in a range of colours to match your home. When used on retail premises these are ideal where the property needs to maintain security but also allow potential customers to view products. Our security grilles come in a variety of fittings and coloured finishes to blend with your existing colour scheme or branding ensuring your staff and property will be protected with an aesthetically pleasing appearance to complement your property. 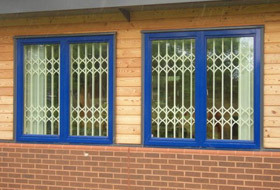 Security grilles can also be suitable where local authority planning restrictions prevent other solutions such as shutters. The Loss Prevention Certification Board - LPCB - offer accredition at the highest level (LPS 1175). Both the Police and Insurance Industry approve products that are tested to standards written by the LPCB and promoted by the police Secured by Design scheme. We supply and install securitygrilles approved to these standards including the SG1001 and CX2 retractable grilles. We are happy to discuss your specific security options with you. You can see the full range of features and benefits of our security grilles and shutters by downloading the SeceuroShield brochure. First for security grilles and retractable grilles Manchester covering Rochdale, Oldham, Bury, Bolton, Salford, Stockport, Wigan, Ashton, Trafford and Stretford, Middleton, Crumpsall, Blackley, Moston, Beswick, Collyhurst, Miles Platting, New Moston, Hulme, Rusholme, Harpurhey, Cheadle, Chadderton, Failsworth, Oldham, Marple, Bredbury, Romiley, Littleborough, Wardle, Eccles, Irlam and Bramhall.